Dad just found the branding iron my grandpa and great uncle used on the Black Angus we raised until my great uncle retired. 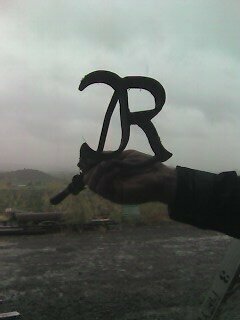 The R is for Great Uncle Ralph and the C is for Grandpa Charles. I was in junior high when the property turned from a ranch to a farm, so I have fond memories of cow pie fights. The best were dry enough to fling like a frisby and soft enough to make a good splat on impact.